A link to "Set up and manage your Comcast Business Private WiFi Netgear router" will be sent via email. Your link to 'Set up and manage your Comcast Business Private WiFi Netgear router' has been sent! 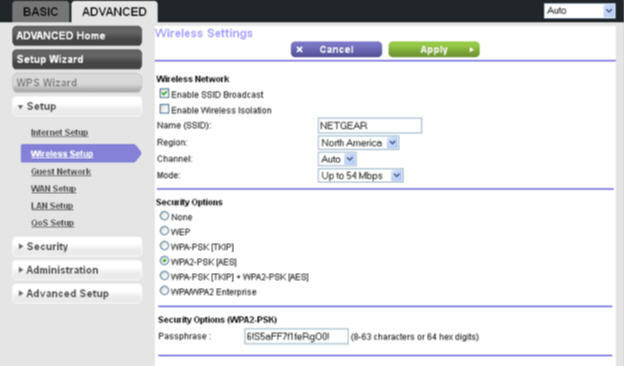 Learn how to install and set up Comcast Business Private WiFi Netgear router. Note: This article applies to the Netgear N300 wireless router. Information on the Cisco Business Wireless gateway device can be found here. Note: Only data connections are depicted here. Each device will need access to an AC power outlet as well. Connect the Netgear N300 Wireless Router to the Comcast Business Internet Gateway. Insert one end of the yellow Ethernet cable into the yellow colored port labeled Internet on the Netgear N300 Wireless Router. Insert the other end into one of the four open ports on the Business Internet Gateway. Connect the AC Power Adapter supplied with the Netgear N300 Wireless Router and turn on the device by pressing the Power On/Off button on the back of the device. Near the center of the area where your computers and other devices operate, and preferably within line of sight to your wireless devices. In an elevated location such as a high shelf, keeping the number of walls and ceilings between the router and your other devices to a minimum. Away from electrical devices that are potential sources of interference, such as ceiling fans, home security systems, microwaves, computers, or the base of a cordless phone or 2.4 GHz cordless phone. Away from any large metal surfaces, such as a solid metal door or aluminum studs. Large expanses of other materials such as glass, insulated walls, fish tanks, mirrors, brick, and concrete can also affect your wireless signal. Using your wireless device (laptop, smartphone), scan for all nearby wireless networks. Look for the default WiFi Network Name (SSID) and select it. The default WiFi Network Name (SSID) is located on the product label on the back panel of the Netgear N300 Wireless Router. This is unique for each Netgear Wireless Router. Enter the router wireless Network Key (Password) and select Connect. The default router passphrase is located on the product label on the back panel of the router. Launch a browser window from the computer or wireless device that is connected to the router. Type http://www.routerlogin.net or http://www.routerlogin.com in the Address field. In the popup window, enter admin for the router user name and password for the router password, both in lowercase letters. Type the old password, and then a new password in the additional two fields. Select two security question and answers. Select Advanced > Advanced Setup > Wireless AP. Select Enable Access Point Mode. Connect a device directly to the router. Launch a browser window from your computer. Type http://www.routerlogin.net or http://www.routerlogin.com into the browser's address field. If this is the first time you are setting up the router, enter admin for the router user name and password for the router password, both in lowercase letters. If you had previously changed the admin credentials, enter admin and the password you created. 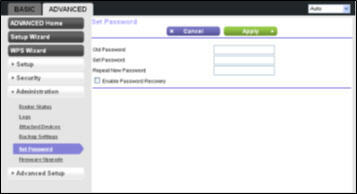 If you do not remember the admin password, and have enabled password recovery, select cancel within the log-in window. This will initiate the password recovery process. Answer the security questions and answers. If you are unable to answer the security questions or haven't set up password recovery, the router will need to be factory reset. Note: Factory-resetting the router will remove all custom settings that may have been configured on the device. This includes the AP mode setting. You should now change the password used to log into the wireless router. Note: The password recovery process is supported in Internet Explorer, Firefox, and Chrome browsers, but not in the Safari browser. Select two security questions and answers. The steps listed below can be used to change the SSID or wireless passphrase. They also can also be used to validate that the SSID is set to broadcast. Type http://www.routerlogin.net or http://www.routerlogin.com in the browser's address field. When the login window launches select Cancel. This will initiate the password recovery process. Answer the security questions . If you are unable to answer the security questions or do not have password recovery enabled, the router will need to be factory reset. Note: Factory-resetting the router will remove all customer settings that may have been configured on the device, including AP mode. On the basic home screen, select Wireless. You can now change the SSID or passphrase. Once completed, select Apply. 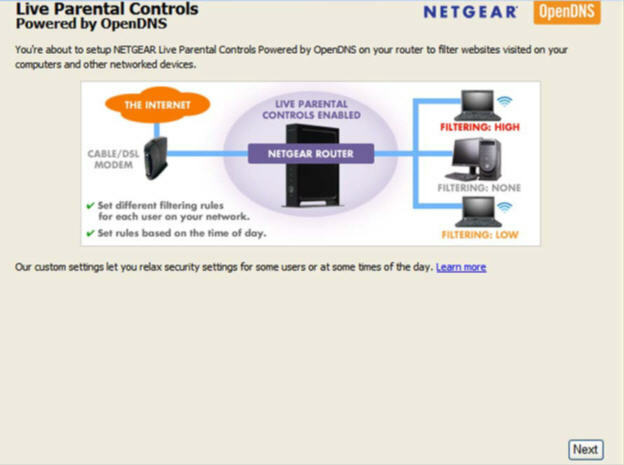 Parental Controls is a content-filtering solution built into the Netgear router that can be set up in minutes to help protect all devices connected to the router, including PCs, laptops and smartphones. 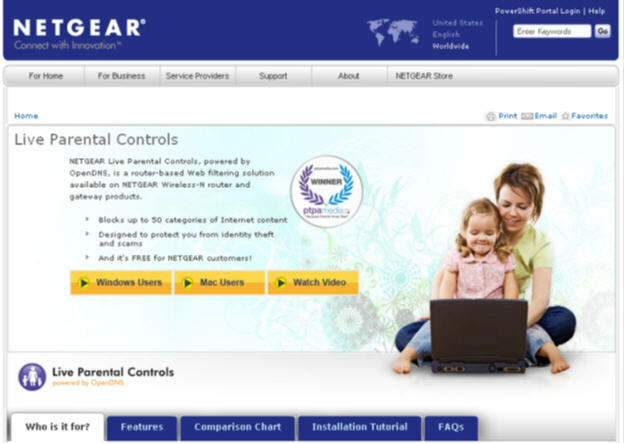 The first time you select Parental Controls from the basic home screen, you are automatically directed to the Netgear website, where you can learn more about Live Parental Controls. On the basic home screen, select Parental Controls. 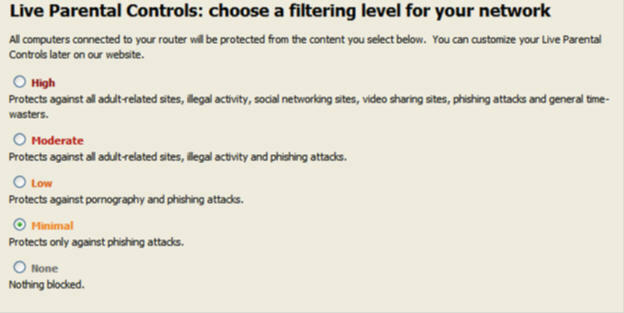 On the Live Parental Controls screen, select either Windows Users or Mac Users. 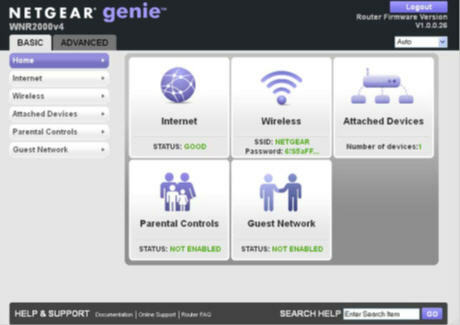 Follow the on-screen instructions to download and install the Netgear Live Parental Controls Management Utility. Once installed, Live Parental Controls will start automatically. Select Next, read the note and select Next again to proceed. Select the radio button that applies and select Next. If you already have an OpenDNS account, leave the Yes radio button selected. If you do not have an OpenDNS account, select the No radio button. A screen will display to let you set up a free OpenDNS account. Select the radio button for the filtering level that you want, then select Next. Select the Take me to the status screen button. Parental controls are now set up for the router. The dashboard will show Parental Controls as enabled. The Netgear router's firmware is stored in flash memory. 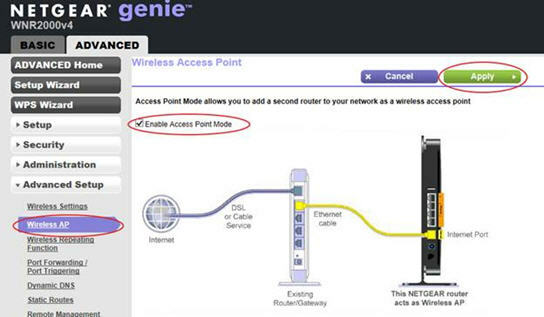 If the router has detected that new firmware is available, you may see a message at the top of the Genie screens. You also can use the Check button on the Firmware Upgrade screen to check manually if new firmware is available. Use the steps listed below to check for new firmware. Select Advanced > Administration > Firmware Upgrade. The router detects new firmware if any is available. If new firmware is available, the Firmware Upgrade Assistant screen displays. Select Yes to update the router to the new firmware. Note: When uploading firmware to the router, do not interrupt the web browser by closing the window, clicking a link or loading a new page. If the browser is interrupted, this could corrupt the firmware. When the upload is complete, the router restarts. The upload process can take up to 3 minutes, and the upgrade process typically takes about 1 minute. Read the new firmware release notes to determine whether the router needs to be reconfigured after upgrading.